A spate of articles in the local papers this week reminds us that Spokane is in Indian Country, and that some of the local tribes are experiencing both economic and cultural renaissances. This interesting article at the Inlander details the efforts of the Spokane Tribe to establish a cultural center at a site adjacent to Riverfront Park: " 'We’re just trying to get a presence back on the riverbanks, where we originated from,' says Glenn Ford, vice chairman of the Spokane Tribal Business Council. Tribal elders don’t plan on simply parking their cars there. They envision a large mixed-use structure housing a living history and cultural center, classrooms for young tribal members, retail shops to help support the endeavor and maybe some office space up above." The Inlander and the Spokesman Review have had a spate of articles in the last week about native stories and issues. The Inlander also featured an appreciate obituary of Spokan leader Gerald Nicodemus. A moving detail from the story is the origin of a song that a Spokan drumming group performed at the funeral: "The Hangman Song is what they played. When Col. George Wright hung three Indians during his punitive campaign against area tribes, the doomed men were allowed time for last words. One sang this song as his death song. It has been passed down ever since." The Spokesman had a front-page story about how the Confederated Tribes of the Colville Reservation are breaking ground on a $41-million-dollar salmon hatchery, meant to restore some of the fish runs that were destroyed by the construction of the Grand Coulee Dam in 1941. At the time of the construction the federal government promised that four fish hatcheries would be built--this will be the fourth. Apparently Joe Peone, director of the Colville tribes’ Fish and Wildlife Program, found a record of the promise ten years ago and realized that his people were owed a hatchery! The Bonneville Power Administration is paying for the construction. Finally the Spokesman had a nice article about the Julyamsh Pow Wow in Post Falls, one of the larger regional pow wows. The picture above is by Spokesman photographer Colin Mulvaney and is taken from this short photo display of the pow wow. The Julyamsh tag at Flickr will bring you to hundreds of additional photographs of this colorful event. A guide to five lesser-known parks that illuminate sometimes murky and forgotten points in American history. Two small towns in Georgia have feuded over which one rightfully holds the title of site of the state’s first gold rush. Great Caesar’s Ghost! Are Traditional History Courses Vanishing? While the number of history faculty has more than doubled since 1975, a smaller share of departments at four-year institutions have specialists in intellectual, diplomatic or economic history. The University of Washington Libraries Digital Collections "features materials such as photographs, maps, newspapers, posters, reports and other media from the University of Washington Libraries, University of Washington Faculty and Departments, and organizations that have participated in partner projects with the UW Libraries. The collections emphasize rare and unique materials." Good collections descriptions accompany all the collections and some have considerable additional material. 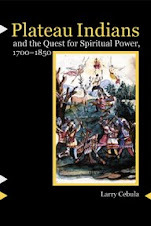 American Indians of the Pacific Northwest, for example, has introductory essays, maps, and "bibliographies and links to related text and images as well as study questions that K-12 teachers may use as they develop curricula in their schools." They also have a blog to help users keep up-to-date with changes in their digital collections. As wonderful as the site is, it could be more interactive. The images are difficult to download and save (which may be a feature rather than a bug!) and there is no Web 2.0 interaction. There is not even a way for users to flag an image that is obviously misidentified. Good news for users of Google Books--a passel of new features on Google Books have been released. The improvement range from better overview pages to browsable thumbnail to improved search within books (my favorite feature). There is even a nifty "page turn" animation. For historian of 18th and 19th century America, Google Book Search is the most radical expansion of available research resources since--I don't know, since JSTOR. (Because of copyright it is much less useful to 20th century historians). Suddenly the number of period books at my disposal has gone from the few thousand at my library to a few hundred thousand--all of them downloadable and subject to keyword searches. 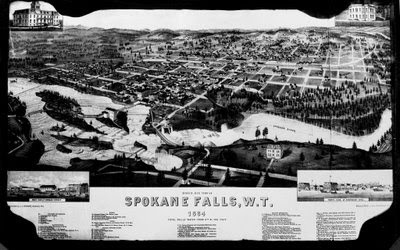 The map is captioned "Spokane Falls, W. T., 1884." Maps such as these, called "Bird's Eye" or panoramic maps, were popular in the late 19th century. Apparently a company that made them traveled through eastern Washington in 1884, as there are bird's eye maps of Cheney and Walla Walla from that year as well. The Library of Congress has a great web exhibit of its panoramic maps, along with a valuable set of essays for understanding the maps. 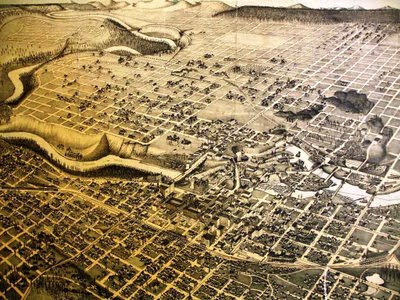 It is important to remember that panoramic maps were created to promote development and investment and "not only showed the existing city but sometimes also depicted areas planned for development," according to an essay by John R. Hébert and Patrick E. Dempsey. So there are varying degrees of fiction and wishful thinking in these maps, and historians have to be careful using them. 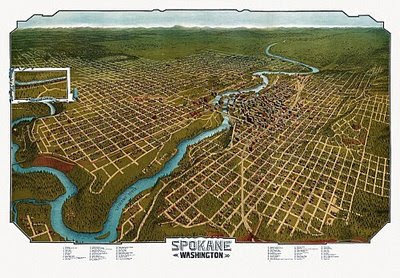 ...both of which show a more developed, commercial town well past the frontier city in the 1884 map. And yet--I can't see using my iPhone to do historical research. What do you think, dear readers? Is this a very impressive novelty or something more? Online Instruction Better than Traditional Classes? The Evidence on Online Education - Inside Higher Ed: "Online learning has definite advantages over face-to-face instruction when it comes to teaching and learning, according to a new meta-analysis released Friday by the U.S. Department of Education. The study found that students who took all or part of their instruction online performed better, on average, than those taking the same course through face-to-face instruction. Further, those who took 'blended' courses -- those that combine elements of online learning and face-to-face instruction -- appeared to do best of all. That finding could be significant as many colleges report that blended instruction is among the fastest-growing types of enrollment." 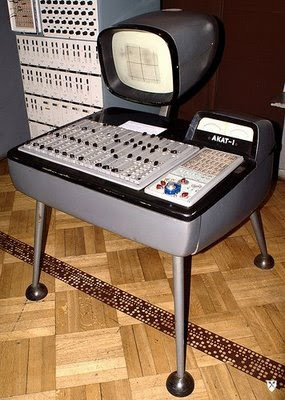 Photo of AKAT-1, "a 1960s vintage Polish-designed analog computer"via Wikipedia. H-NET is in decline. What should be done about it? The Chronicle of Higher Education has an interesting article up right now. 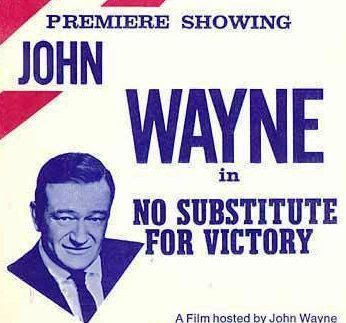 Change or Die: Scholarly E-Mail Lists, Once Vibrant, Fight for Relevance: "Once they were hosts to lively discussions about academic style and substance, but the time of scholarly e-mail lists has passed, meaningful posts slowing to a trickle as professors migrate to blogs, wikis, Twitter, and social networks like Facebook." H-NET in in financial trouble as well. In an "open letter to our readers" the H-NET leadership cites declining revenue, aging servers, and other factors to encourage donations from H-NET users. I gave and so should you. At the same time I completely agree with Frank E. Reed's point that the last thing H-NET should be doing is replacing old servers to host their clunky legacy software. And finances are not the only problem at H-NET. As the Chronicle article points out H-NET suffers as well from declining relevance. The email lists have less and less traffic and have gone from being places of scholarly discussion to electronic bulletin boards--a worthwhile function, but a lesser one. My career has tracked the rise of H-NET pretty closely, and H-NET has been a tremendous boon to me. Right out of grad school I took a 4/4 teaching job at an open-admissions state college in the rural Midwest. With few campus or travel resources, a heavy teaching load, no network of scholars in my field, and no expectation to publish, it was your classic black hole of a job--a place you go and no one ever hears of you again. But I managed to stay in the game, and it was in part because of the H-NET listservs. I used the H-NET lists in my subfields to find people for conference panel proposals, test research ideas, make professional contacts for grants and such, and to keep my own name out there. I didn't become famous (and it isn't looking likely!) but to me H-NET was an absolute lifeline. That said, H-NET never fulfilled its early (and perhaps unrealistic?) promise. A lot of us hoped that the H-NET lists would be places for scholarly conversations, the sort of exchange of ideas that happens across the lunch banquet table at the best academic conferences. This did sometimes occur, especially in the early days of H-NET. 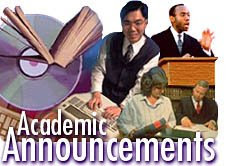 But by five years ago the lists had quieted down to become less discussion oriented and more like campus bulletin boards carrying academic announcements and the occasional bibliographic inquiry. Many lists seem to have faded away entirely as the traffic has moved to blogs, twitter, and other social networking sites with greater functionality. As bad as the user interface is, the administrative interface for the list moderators is light years worse. I once trained to a moderator (then I irresponsibly flaked out on actually doing it--sorry, H-NET!) and was flabbergasted by the byzantine procedures of lopping off people's signature lines, knowing the right listserv commands, etc. So what is to be done? My proposal is to take one H-NET list and its members and try to bring them into the 21st century. Begin by dumping the proprietary software and transferring the list to Google Groups (or something similar). Eliminate moderator's approval to post, which impedes the flow of ideas, but allow moderators to discipline and ban spammers and trolls. At the same time, create a weblog for the list where every single subscriber has the ability to create a post. Such a multi-authored blog is quite unusual in academia but I have no idea why. Sites such as Metafilter, a "community weblog" with something like 80,000 members who can create posts, show that this model can create a vibrant online community. And why stop there? Give the new H-NET list a Facebook page and a Twitter feed and a Delicious account. This is a very different model for H-NET, and like most Web 2.0-ey innovations it relies on giving up control over what H-NET is. But is there really a choice here? To return to the Chronicle headline, the choice is to innovate or die. And H-NET is too important to let die.